The big bang. Call me crazy, but it does not appear to me that explosions end in great order and design. As a young teenager (guess the moral direction of this story) we used to place these things called M80s into various apparatuses. Then, we would proceed to light the fuse of the M80s, run, witness extraordinary carnage, laugh, and then repeat (do not try this at home). And there is something I noticed from those several years of pyro-depravity experimentations: the apparatus into which the M80 was placed never proceeded from a state of less order and design to more. It was quite the opposite. If there’s one thing I learned, it’s that impersonal big bangs never caused extraordinary order. For this reason, the impersonal Big Bang theory has been confusing as an explanation for the existence of the universe. Things like the intense orderliness, organization, and design within the universe seem contrary. Now, I understand that the Big Bang theory is significantly more complex than depraved teenagers and M80s and there are intellectually brilliant individuals who believe in the theory. Even so, the wonder of things like our solar system, galaxy, and universe seem to defy an impersonal theory of explosion. And even more, Scripture presents a far more plausible explanation; that all things came into being through the eternally existing Lord Jesus Christ (Gen. 1:1, John 1:3, Col. 1:16, Heb. 1:2). Earth. Among other things, it’s a planet at the perfect location, density, rotation, temperature, and distance from the sun to harbor life. It is about 25,000 miles around with a mass of 6 x 1024 kg (or about 13,000,000,000,000,000,000,000,000 lbs). 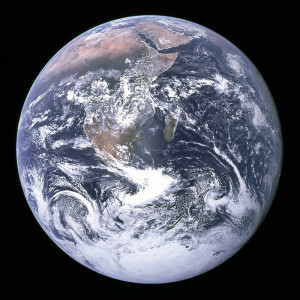 And, as God revealed many centuries B.C., the earth hangs on nothing (Job 26:7). How an object that heavy hangs on nothing still baffles me. And while it hangs on nothing, our earth spins at 1000 miles per hour (while the moon moves at about 0.6 miles per second around the earth, never flinging away). While it spins, the earth is also moving around the sun at about 18 miles per second. Every second, our earth has traveled another 18 miles. Did you feel it? Did you feel it that time? So, in a year, we have made the 584 million mile trip around the sun. You may not travel to the next state, but, every year, you make a 584 million mile trip around the sun (tell that to your frequent flyer carrier). Every year, again and again. And the earth never flings off into oblivion. It always stays its course and maintains the perfect distance, rotation, and velocity. We could also talk about how the earth tilts back and forth while it spins at 1000 mph and moving at 18 miles per second, helping to keep the seasons in check. Impersonal explosions can’t do that. “The heavens declare the glory of God” (Ps. 19:1). The sun. With a circumference of about 7 million miles, if the sun was a hallow shell, you could fit about 1.3 million earths inside of it. At the surface, our sun is about 10,000 degrees Fahrenheit, and at the center, a tad warmer, at around 28,000,000 degrees. How does it stay that warm? To what is it plugged in? Who pays its electric bill? And, like Earth, it too hangs on nothing. All the while light from the sun is constantly emanating, moving at about 186,000 miles per second. 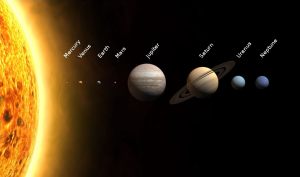 Now, our sun is the star in our solar system, but, only one of somewhere between 200-400 billion other stars in our Milky Way galaxy, in addition to an estimated 100 billion planets. Our solar system. Made up of the sun, eight planets, and, among other things, over 3000 known comets blasting around. Now, while our earth cruises at 18 miles per second (and rotates and the moon spins around us), our entire solar system also moves, but much faster. Our sun, together with the eight planets and everything else, bolts throughout our Milky Way galaxy at about 130 miles per second. And it’s not moving randomly, but making an orbit around the center of our galaxy. Despite moving at 130 miles per second, it will still take us about 225 million years to do one lap around the Milky Way. And all the while, us, the moon, earth, the other seven planets, and the sun—it all remains in calm harmony. That’s a lot of plates to spin. And, again, something an impersonal explosion could not produce. Our galaxy. The solar system is sort of like the street on which we live, while the galaxy is the town. 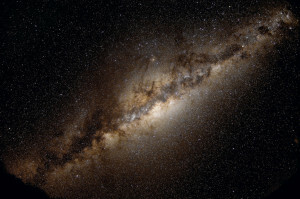 The Milky Way is a spiral galaxy, about 100,000 light years across. That means that light travelling at 186,000 miles per second takes 100,000 years to make it across our galaxy. Even so, it is small compared to, for example, the M87 galaxy, which is about one million light years across. But, can something as huge as our galaxy move? With our solar system and the 200-400 billion other stars in it, the Milky Way scoots throughout the universe at about 370 miles per second. So, as we spin at 1000 mph, move around the sun at 18 miles per second, and tilt back and forth on earth, we are also moving, with the solar system, at 130 miles per second through the Milky Way, while we (and 200-400 billion other stars) bolt throughout the universe at 370 miles per second. And we eat, sleep, rest, and enjoy a cool summer breeze. And let’s not forget that there are an estimated 200 billion other galaxies out there in the observable universe. How many stars? Estimates vary, but most agree that there are at least one with 20 zeroes after it. “He counts the number of stars; He gives names to all of them” (Ps. 147:4). And I always get a kick out of the brevity God gives to his creation thereof: “the stars also” (Gen. 1:16). Finally, there are these things called black holes. These “holes,” for lack of a better term, are sort of like the real Bermuda Triangles of the universe: if you or a planet or anything could get near one, you would be pulled in never to emerge. 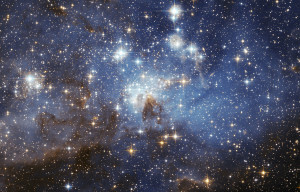 They are so powerful, that not even light moving at 186,000 miles per second can “get out,” hence the name. Theoretically, as you were “in” there, the experience of “there” would defy all sensory experiences you have ever had. It’s thought that they can do things like change time, though, admittedly, much remains unknown about these astronomical beasts. Perhaps this is God simply enjoying himself. “When I look at your heavens, the work of your fingers, the moon and the stars, which you have set in place, what is man that you are mindful of him?” (Ps. 8:3-4).